Falls City, Nebraska is in the path of totality for the Total Solar Eclipse of August 21, 2017! Observers there will see (appx.) 2m 37s of totality! This is one of the longest in the United States!! 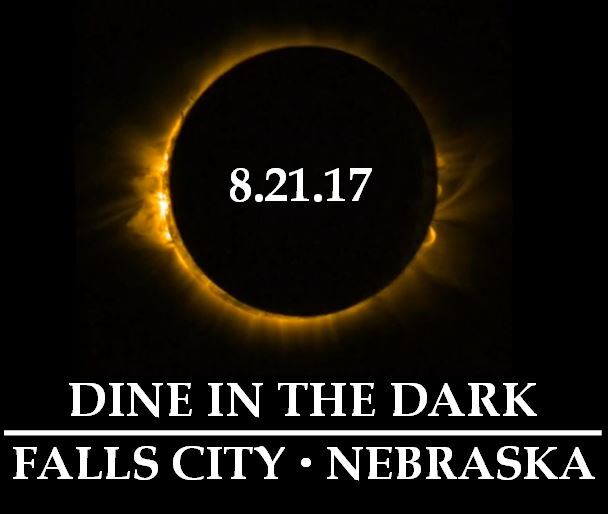 Come join us for the Total Solar Eclipse and “Dine in the Dark”! Falls City will be hosting a luncheon on our downtown cobblestone streets! The meal will be catered local restaurants by A&G and Cakes & ‘Que! Our ticket bundle will include the protective solar glasses you need to safely view the eclipse, a commemorative t-shirt and your meal ticket. Come join us for food, fun, and a once in a lifetime opportunity!! UPDATE: WE HAVE SOLD OUT OF “DINE IN THE DARK” TICKETS!! If you have purchased tickets, a list of frequently asked questions, including information on parking will be e-mailed out the week of the 14th. A limited amount of additional T-Shirts will be available for purchase on August, 21st! T-Shirts are unisex sizes. We have Youth Extra Small to Adult 4 XL available. This is the graphic that will appear on the T-Shirts. While tickets for Dine in the Dark may be sold out, you are still invited to visit beautiful Falls City. Check out these are hot spots around the area! Falls City Jaycees Arena – 1 ½ miles south of Falls City on Hwy 73. Parking available for a free will donation! Richard County Museum – 1401 Chase St. Falls City. Serving Lunch from 11:30-1:30. Hot dogs, chips, cookies & water for $5. Solar glasses available. Falls City Elks Lodge – 1417 Stone St. Falls City. Serving food from 11 am to 9 pm. Large parking lot for viewing the eclipse. Wild Bills Bar & Grill – Hwy 159 & Main St Rulo, NE. Burgers & Brauts served 9 am to 3 pm. 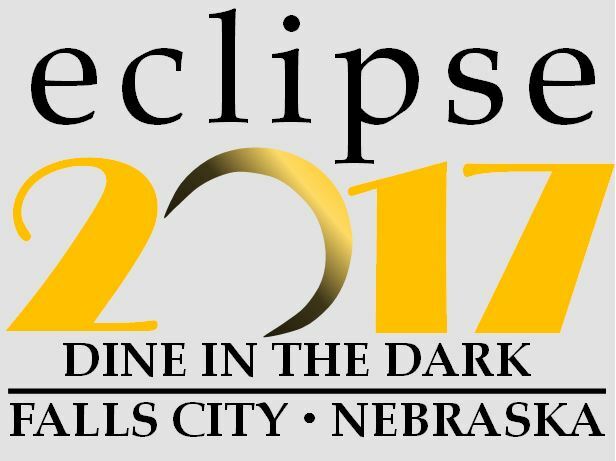 Watch the eclipse while overlooking the Missouri River! Indian Cave State Park – 65296 720 Rd Shubert, NE. Free solar glasses while supplies last! Still Centerfield – 102 Main St Shubert, NE. View from the beer garden! Food & drink specials till 6pm. Free eclipse glasses to the first 50 people! Barn Café – 65215 705 Road Falls City, NE. $10 Eclipse lunch in parking lot. Beef burger, chips & drink and a place to watch the show! Bring lawn chairs. Restrooms available. Text 402-801-2545 to reserve! American Legion Club – 721 Harlan St. Falls City, NE. $10 car, $15 truck parking. Call 402-245-3590 for reserved parking. Serving $5 beef burgers. Dorr & Clark Parking Lot – 2303 Harlan St Falls City. 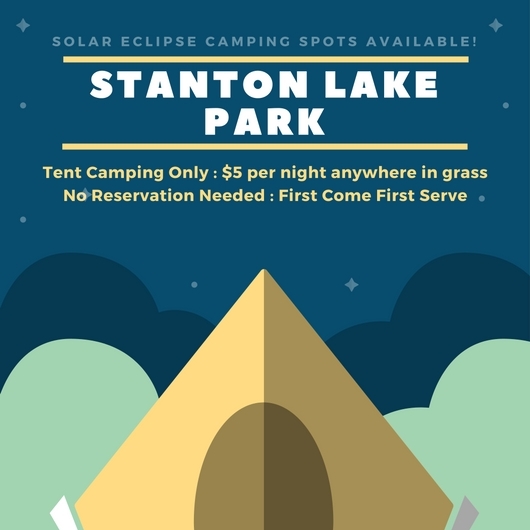 $15 for a parking spot to view the eclipse. Bring your own chairs!